Harley-Davidson® of Nassau County is an authorized Harley-Davidson® dealership on Long Island, in Bellmore, NY. Along with a large selection of new models, Harley-Davidson® of Nassau County carries a wide variety of super clean pre-owned models. 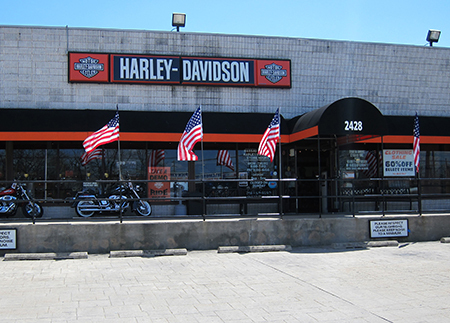 Harley-Davidson® of Nassau County provides superior customer service and has an entire team that consists of professional sales members, finance experts, service technicians, and a knowledgeable parts and accessories staff to support you. We pride ourselves on having well-trained experts that strive for customer satisfaction. Come in and visit our friendly, reliable, and experienced Harley-Davidson® staff. Harley-Davidson® of Nassau County will help you maintain your Harley-Davidson® so that it runs for years. If it is having problems, we can diagnose and repair your Harley-Davidson®! Schedule your service appointment today. Our parts department has the largest selection of high quality Harley-Davidson® parts and accessories in the area. Fill out a parts request form to see if we have the part in stock, and if we don't we can order the item for you. We welcome you to our Harley-Davidson® dealership and we look forward to providing you with the best source for Harley-Davidson® products and services. We are dedicated to serving you. Visit us today, you won't be disappointed. Hope to see you soon! Harley-Davidson of Nassau County's has earned six Bar & Shield Awards to include the Gold Circle of Excellence Award for 2012, the Silver Circle of Achievement Award for 2015, 2015 and the Bronze Circle of Recognition Award for 2014, 2016 and 2017. Harley-Davidson® of Nassau County assumes no responsibility or liability for any errors or omissions in the content of this site. We do not warrant that this site and any information or material downloaded from this site, will be uninterrupted, error-free, omission-free or free of viruses or other harmful items.